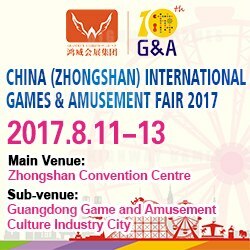 The 10th annual China International Games & Amusement Fair will be held at the Zhongshan Convention Centre between August 11 and 13, 2017. The 2017 fair will cover an exhibition area of 100,000 square meters and is expected to attract 400 exhibitors. First held in 2008, G&A managed to become the world’s most forward-looking and the most attractive high-end trading fair at one stroke with contracts worth millions of RMB signed at site. From 2010 to 2016, G & A the exhibition scale rose from 44,000sqm to 75,000sqm, and the number of exhibitors has risen from 243 to more than 400, which makes G&A one of the largest-scale game and amusement fairs in China. More about 400 companies exhibited at G&A 2016, which covered an exhibition area of 75,000sqm. According to the official data, G&A 2016 attracted 16,356 professional purchasers from over 36 countries and regions such as America, France, Korea, Indonesia, Switzerland, Turkey, India, and Dubai. Thousands of games and amusement equipment (indoor and outdoor) were displayed. Since the 2017 exhibition invitations were sent, 263 past exhibitors have confirmed their booths. Amusement brands such as UNIS, WAHLAP, Golden Dragon, G-LOOK, Golden Horse, rides brands Jiuhua, Global, Derun Rides, Kingsun and Design brands such as UNITE ART, Matee, Huazhongxing, Shi Merit, Leshanshui, Ebulliency, Max and Icom have confirmed that are returning in 2017.